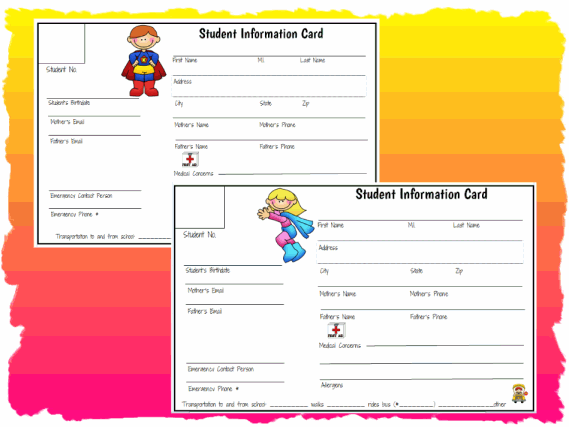 Here are two adorable "Student Information Cards" to copy and use for your classroom. The top card features a boy superhero boy for your male students and the bottom card features a girl superhero girl for your female students. Enjoy! Here are some cute boys and girls restroom passes to use in your classroom. Print out on white card stock, write your room number in the box provided, and then laminate for greater durability. These passes use cute thistlegirldesigns. Enjoy! Make your weekly parent contacts a breeze with this cute and teacher friendly weekly bee-havior report. 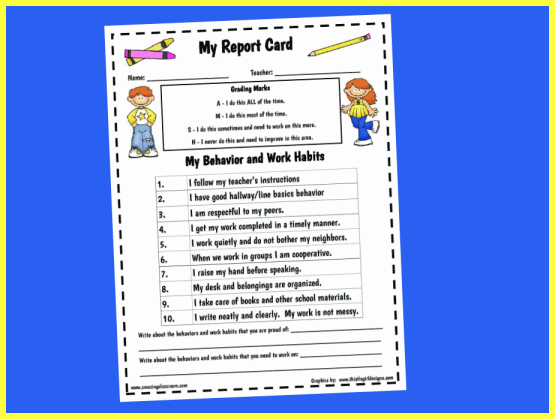 This behavior report includes cute graphics from thistlegirldesigns, perfect for elementary school-aged children. It includes the areas of behavior and work habits with easy to read fonts. 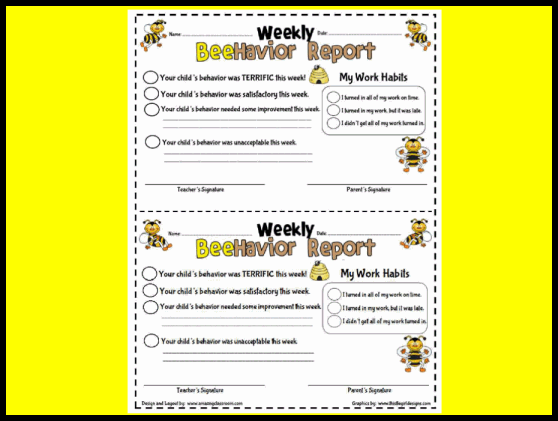 Each behavior report is a half-page, allowing you to print two behavior reports per page. This version now has name and date lines added. Use this student self-reflecting behavior and work habits report card for students to score themselves. Students will be very honest and you can use this during student led conferences, or more than one time throughout the year to gauge students' improvement. The students will grade themselves in ten different areas using the grading marks given. Enjoy! This resource is packed full of five different reading stations or center activities. 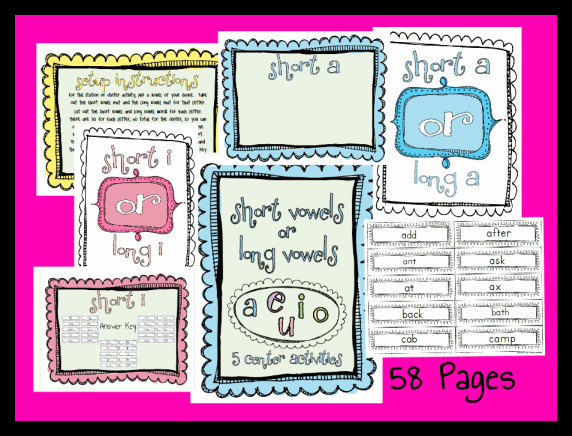 It includes one different station for each of the short and long vowels a, e, i, o, and u, one title page for each center, 2 sorting mats for each vowel, 60 different word cards for each vowel, and an answer key. We've also included a blank set of word cards for you to add your own words. This resource is great for the early reader. 58 pages. Enjoy! 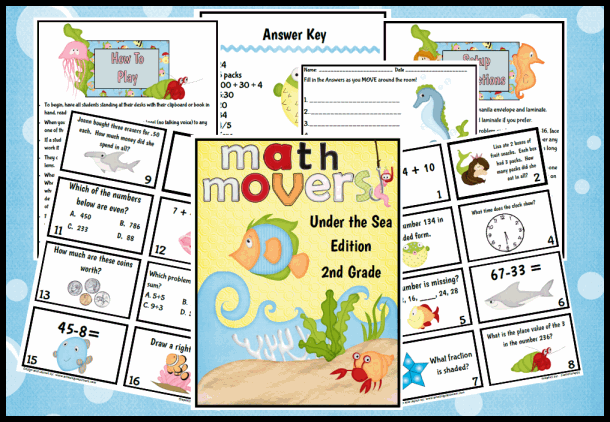 Your students will have a blast playing this fun game for math review. This is an entire class activity where they move around the room quietly to solve all sixteen math problems. Some of the problems in this set include multiplication, angles, fractions, counting money, word problems, patterns, plus more. This "Buggy Edition" set has different problems than the Monster's set for a whole new game! This set may also be suitable for 3rd. Enjoy! 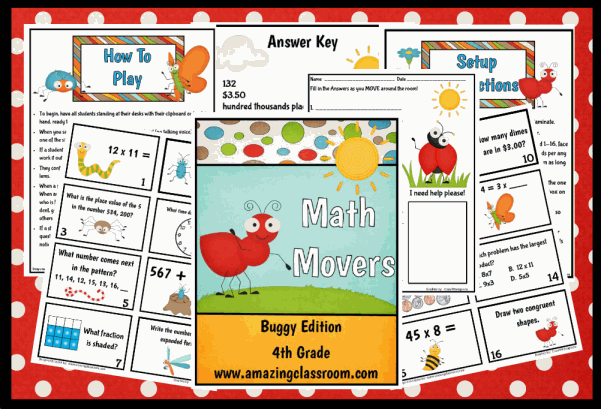 Your students will have a blast playing this fun game for math review. This is an entire class activity where they move around the room quietly to solve all sixteen math problems. 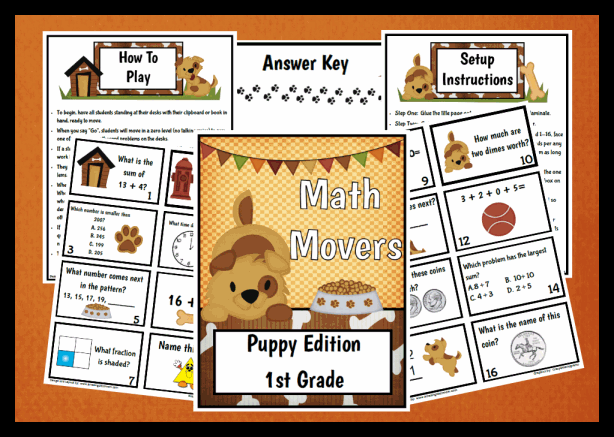 Some of the problems in this set include addition word problems,money, double digit addition, patterns,multiple addends, time, plus more.This game takes approximately 30 minutes to play! Enjoy! Also suitable for late Kindergarten or early 2nd grade learners. 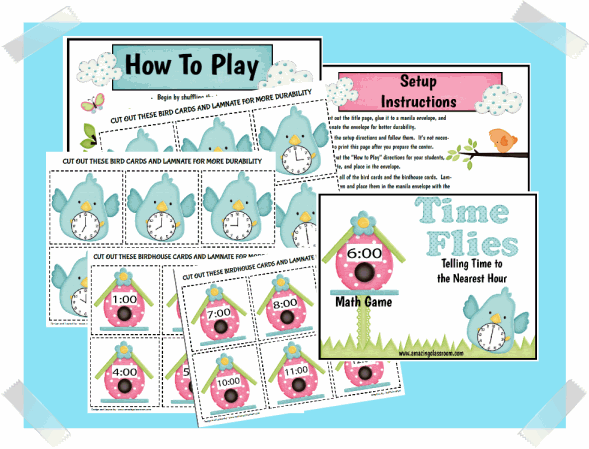 Your students will have fun learning to tell time to the nearest hour with this "Time Flies" Math center game. This game includes twenty four playing cards, twelve with the analog time and twelve with the digital time. The students play in pairs to match the bird to their correct bird houses while having fun! This game is best suited for Kindergarten or first grade. Enjoy! 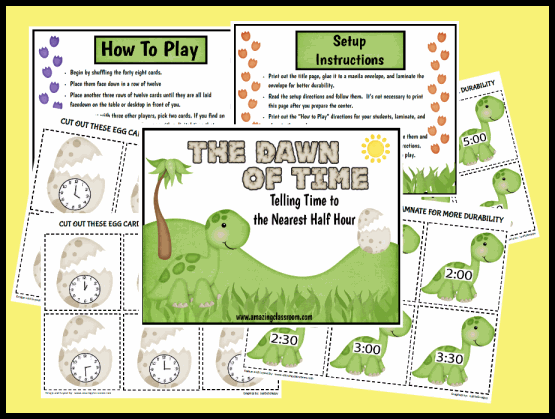 Your students will have fun learning to tell time to the nearest half hour with this "Dawn of Time" Math center game. This game includes forty eight playing cards, twenty four with the analog time and twenty four with the digital time. The students play in groups of three or four to match the dinosaur to their correct egg while having fun! This game is best suited for Kindergarten or first grade. Enjoy!